Part of a growing trend, more and more nurses with doctorates, who are breaking ground in research and leadership. 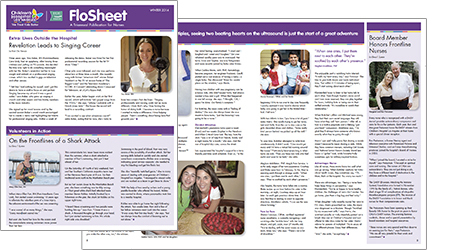 Four such nurses are spotlighted in this feature in Children's Hospital LA's nursing publication, FloSheet. Flerida Imperial-Perez, MSN, RN, CNS-BC, CCNS-P, intended to go back to school much earlier in her career, but "life happens," she says. In between degrees, she married and had two boys, then waited until they grew up. By the time she entered the PhD program at the UCLA School of Nursing in 2015, her youngest son, Tristan, also entered college as a freshman. They are hoping to graduate at the same time in 2019. These days, mother and son check on each other's homework. "He'll say, 'Mom, when in your paper due? And you're just starting it now?'" says Imperial-Perez, clinical manager of the Thomas and Dorothy Leavey Foundation Cardiothoracic Intensive Care Unit (CTICU) at Children's Hospital Los Angeles. She is one of four CHLA nurses currently in the same cohort in the UCLA School of Nursing PhD program, and — fingers crossed — now midway through. The others: Paula Belson, MSN, RN, CRNA, CRNA Manager, Anesthesiology; Allan Cresencia, MSN, RN, CPN, clinical nurse, Post-Anesthesia Care Unit (PACU); and Tracy Ono, MSN, RN, PHN, clinical nurse, Pediatric Intensive Care Unit (PICU). Together, this quartet represents the groundswell of nurses throughout CHLA earning advanced degrees, and a trend in the nursing profession as a whole to view a doctoral degree as the natural educational endpoint for nurses. Less than two decades ago, CHLA had just two doctoral-trained nurses. Today, there are 24, with another 25 currently in PhD, DNP (Doctor of Nursing Practice) and other doctoral programs. "Nurses are taking on more responsibility and more research," notes Suzanne Taylor, EdD, MSN, RN-BC, director, Clinical Education and Professional Development. "That makes an advanced degree more important than ever."